In a large skillet, with a tight lid, heat the olive oil over medium heat. Add the garlic and cook until fragrant (30 seconds). Add the broccoli rabe, and chicken broth, season with red pepper flakes. Remove the broccoli rabe and place aside, turn up the heat to medium high and simmer the broth until it’s reduced by half, pour this over the broccoli rabe. 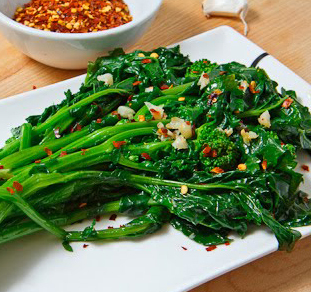 This entry was posted in Metabolic Medical Center Recipes, Vegetables and tagged broccoli rabe, Metabolic Medical Center Recipes by foodies4mmc. Bookmark the permalink.